As the 2019 wedding season prepares for liftoff, we have scoured the top wedding magazines, websites and blogs to bring you the latest bridal accessory trends – from bling crowns to bridal belts, it’s all here, so get yourself comfy. Taking influence from Meghan Markle’s pared back wedding dress, this year’s bridal gowns are all about simple fabrics and figure-skimming tailoring. In contrast, hair accessories and jewellery are going bigger and bolder! Alongside chandelier and drop earrings, the next 12 months will see brides topping off outfits with statement crowns, tiaras and headpieces. 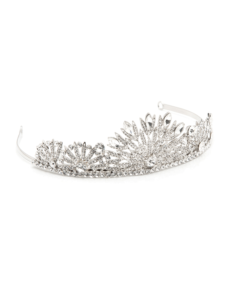 Up the sparkle factor with our award-winning Harper bridal tiara. 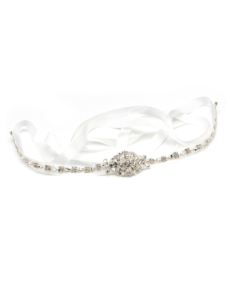 Encrusted with crystals, it is an all-eyes-on piece and looks stunning with or without a veil. The key for balancing a tiara is keeping hair soft and tousled and make-up subtle – strong make-up can push the look into Pageant Queen territory – a definite no, no! 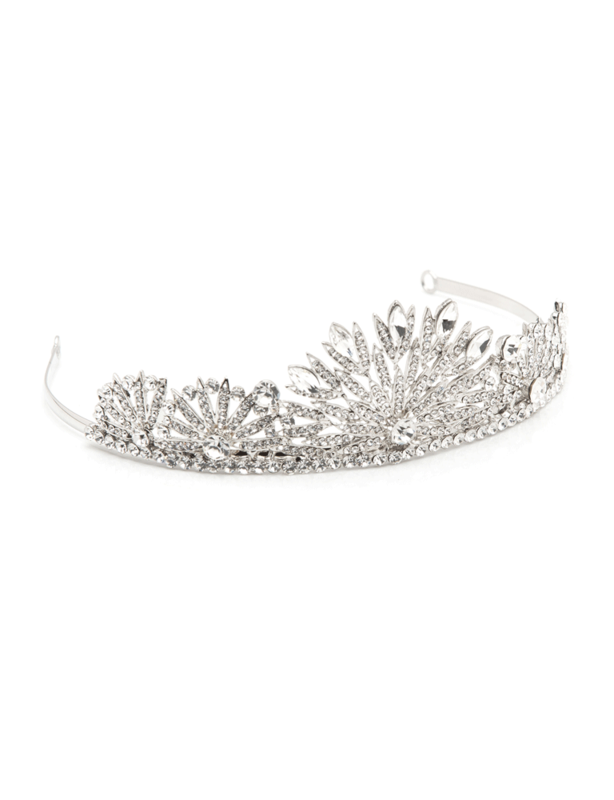 If a traditional headpiece feels a bit much, opt for a modern tiara. 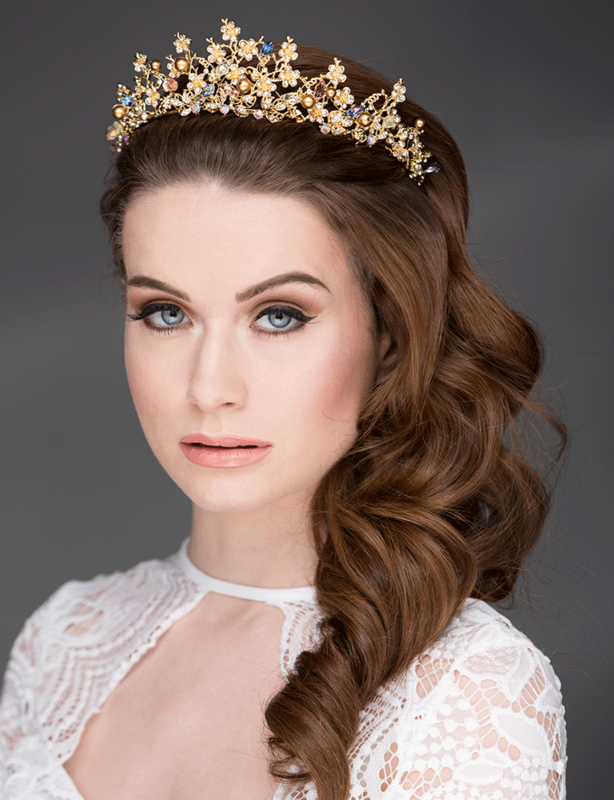 This Miren tiara has lots of on-trend elements, larger proportions, warm metallic frame and coloured gems. Pair with laid-back hair for an ethereal ‘Midsummer’s Dream’ boho bride look. Now here’s a style we can get into for 2019, waist-cinching bridal belts. As well as setting off simple, streamlined wedding dresses, belts and sashes are the ideal accessory for bridal separates – which are also set to be big this year – think skirts and bodices and playful palazzo pants with matching tuxes. Iconic designer Vera Wang uses brightly coloured grosgrain ribbon belts in her Spring 2019 collection, while Catherine Dean’s dresses and separates feature subtle satin ribbon ties and jewelled belts. 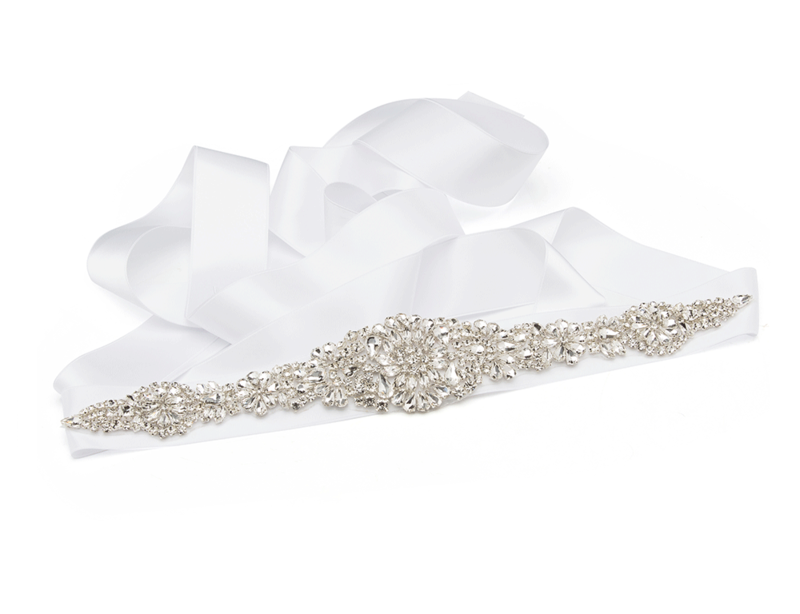 This elegant hand-crafted Jasmine wedding belt with stunning crystals will add a touch of sparkle to your dress and bridesmaids’ gowns. The ribbon tie looks exquisite trailing behind too. 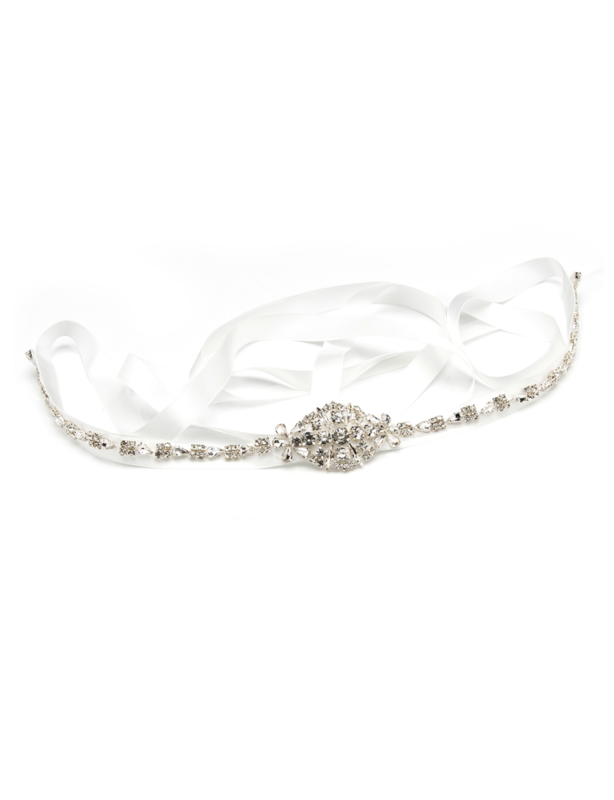 For maximum impact, try the Orla bridal sash with teardrop and round crystals. Its bold design looks beautiful against all types of material, including silk, lace and organza dresses. Again, we have Meghan Markle’s classic wedding style to thank for these little beauties. With classic, simple wedding outfits taking centre stage, it’s all about the eye-catching extras, including bracelets and cuffs. Whether your style is edgy or traditional, wearing some serious wrist candy is key. If you’re opting for a traditional white wedding, the curved detailing and pretty clusters of crystals on this Cora cuff are just the thing. Or introduce some warmth with this handmade Gianni cuff in rose gold. 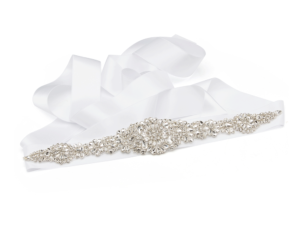 *Top tip* Going for a ribbon tied cuff over a traditional wedding bracelet is best as there is less risk of a clasp or catch snagging your dress fabric. You heard it from us! Following on from last year, florals remain a top bridal theme for 2019. Dresses dotted with 3D lace and applique flowers were in abundance at bridal fashion week. If full on floral isn’t your thing, it is easy to weave flowers into your look, especially with hair accessories. Hair vines especially look pretty and are super versatile as they can be crafted into a halo design, a headband or fastened around a loose bun or braid. 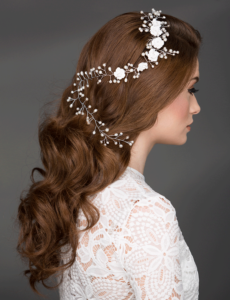 Get some flower power with this hair vine adorned with delicate white roses, crystals and pearls. These decorative floral hairpins – like mini blossom branches – are one of our brides’ favourites and can be tucked into a huge variety of hairstyles. 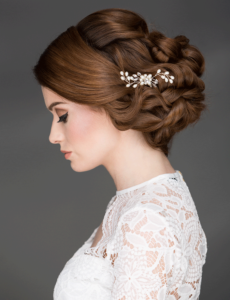 Or for a subtle look, weave single flower hairpins through a soft, tousled updo or fishtail braid.